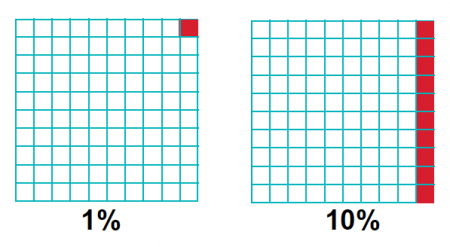 We explain what a percentage is, how children are taught to understand the concept, to find percentages of numbers and to compare fractions of amounts to percentages of amounts. If a park covers 5km² and 1km² is covered in grass, we know that 1/5 of the park is covered in grass. If we convert this to a percentage, we say that 20% of the park is covered in grass, because 20/100 is equivalent to 1/5. If there are 30 pupils in a class and 15 of them have packed lunches rather than school dinners, we can say that 1/2 the class have packed lunches. If we convert this to a percentage, we say that 50% of the class have packed lunches, because 50/100 is equivalent to 1/2. Children are introduced to decimals in Year 4 where they are taught to recognise the equivalence between decimal and fraction forms. They need to know that 0.5 is equivalent to 1/2, 0.25 is equivalent to 1/4, 0.01 is equivalent to 1/100 and 0.1 is equivalent to 1/10. This knowledge gives them a good grounding for learning about the concept of percentages which is introduced in Year 5. In Year 5, children learn to recognise the percent symbol (%) and understand that per cent relates to 'number of parts per hundred'. They need to write percentages as a fraction with denominator 100 and also as a decimal. For example: they might be shown 20% and asked to write this as 20/100 and 0.2. Here, they would need to know that because 10 is 1/10 of 100, they are basically finding 1/10 of the quantity. 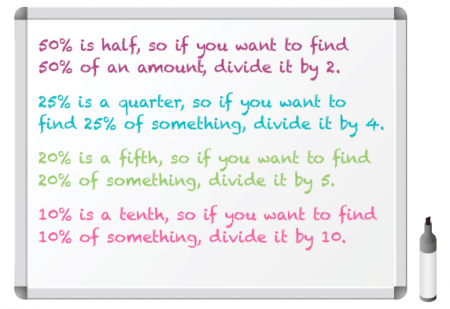 To find 1/10 of something you need to divide it by 10. So they would need to divide 4kg (or 4000g) by 10 to make 400g. Here, they would need to first find 10% of £5. The best way to do this would be to divide 500p by 10, which equals 50p. Since they are finding 5% which is half of 10%, they would need to halve the 50p which would give them 25p. Here they would need to find 10% of 8m (800cm ÷ 10 = 80cm) and 5% of 8m (80cm ÷ 2 = 40cm) and then add them together (80cm + 40cm) to make 120cm. Here they would need to find 10% of £15 (1500p ÷ 10 = 150p) and then multiply this by 4 (150p x 4 = 600p = £6). I see a jumper in a shop window priced at £45. The next day the jumper is reduced in price by 30%. How much does the jumper cost now? A child would need to work out 10% of £45 (£4.50) and then multiply this by 3 (£13.50). They would then need to take this £13.50 away from the £45, which would give them £31.50. There are 140 sweets in a jar in a sweet shop. Katy buys 2/5 of the sweets. John buys 45% of the sweets. Work out how many sweets each child buys. Who buys more sweets? To work out what Katy buys, children would need to find 1/5 of 140 which is 140 ÷ 5 = 28. 2/5 would therefore be 28 x 2 = 56. To work out what John buys, children would need to find 10% of 140, which is 140 ÷ 10 = 14. They would then need to multiply this by 4 to make 40% which would equal 56. To find the 5% they would need to halve 10% of 140 (14) which would make 7. Then to find 45% they would need to add the 40% (56) to the 5% (7) which would make 63. So Katy buys 56 and John buys 63 sweets, which means John has bought more.